NOTE: This information is based from the information gathered from the DEC plan available at the DEC website. The info below is for just part of what will be the North Country Trail in the Adirondacks. The 92,000 acre Vanderwhacker Mountain Wild Forest is located in the central Adirondack Park. This wild forest borders or contains 44 ponds and small lakes, as well as portions of the Hudson River and much of the Boreas River. Vanderwhacker Mountain Wild Forest lies both east and west of NY 28N in western Essex County. 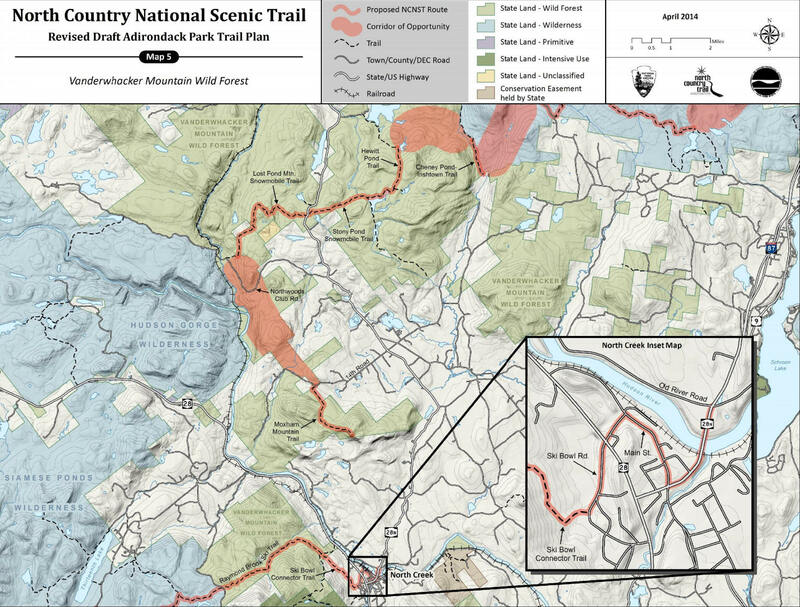 The NY DEC changed the original route of the future North Country National Scenic Trail in it's 2007 proposal compared to the current 2014 revised route. The original 2007 proposed route had the NCT traveling through Hudson River Gorge Primitive Area. The new 2014 DEC revised proposal actually has a large gap in the route of the NCT, although it will take thru hikers into the small hamlet of North Creek. This will create a much needed resupply point for hikers of the NCT. The future North Country Trail enters Vanderwhacker Mountain Wild Forest from Siamese Ponds Wilderness as the trail crosses Barton Mines Road. The future NCT will follow the seldom used Raymond Brook Ski Trail and then uses the Ski Bowl Connector Trail as the trail enters the small hamlet of North Creek. The trail now travels along roads as it goes through the small town, eventually crossing the Hudson River on the NY 28N bridge over the river. According to the revised 2014 DEC plan, there is a gap in the trail from the crossing of the Hudson River to Moxham Mountain. We believe that the plan will have the future NCT use Old River Road to the end of the road, which is the access point for state land. From there a new trail will need to be built to meet up at some place with the Moxham Mountain Trail. At the Moxham Mountain trailhead on 14th Road, a new trail will be built to bring the trail toward Northwoods Club Road and on to meet up with the Lost Pond Mountain Snowmobile Trail. This will take the future NCT to the crossing of NY 28N. At NY 28N, the future North Country National Scenic Trail follows the Stony Pond Trail heading east for approximately 1.8 miles. The Stony Pond Trail branches and the North Country National Scenic Trail will follow the northern branch toward Hewitt Pond. There is a lean to available at Stony Pond. Check out the video below of this section of the trail. The North Country National Scenic Trail follows the Hewitt Pond Trail before turning east near Barnes Pond. On a new future trail, the North Country National Scenic Trail continues northeast crossing Hewitt Pond Brook. This could be a difficult stream crossing. After crossing Hewitt Pond Brook, the North Country National Scenic Trail intercepts an existing herdpath (not shown on the map below) on the north side of the Brook and follows that herdpath south to the Irishtown Snowmobile Trail. The North Country National Scenic Trail crosses the Irishtown Snowmobile Trail and enters the Hoffman Notch Wilderness on its southwestern boundary. Look below for a few pictures, a video and a map of this future stretch of the North Country Trail.